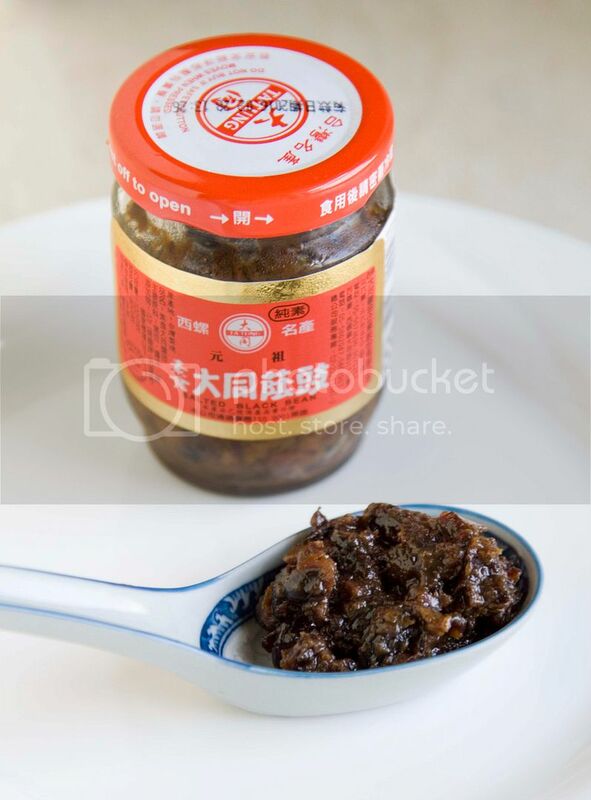 Salted black beans, fermented black beans, or 豆豉 - It's one of the traditional condiments that can be found in Taiwan and other parts of Asian countries. The beans have to go through fermentation process using salt/alcohol, drying, and other steps in order to bring out the aroma and natural sweetness. As my first time cooking with salted black beans, my mom provided some help by nagging throughout the time while I was in the kitchen. Annoying? No, but rather fun and memorable. Cut the chicken tenders into large bite sizes and marinade with 1 tablespoon of soy sauce. There is no need to marinate the meat for extended period of time, just do it in the beginning before preparing other ingredients. Peel and chop off the very tough ends of the garlic cloves. Smaller cloves are preferred because it'll be easier to eat as a whole once the dish is done. Remove the scallion stem and cut the remaining, about 2 inches in length. Finely chop the fresh chilies and set aside for later use. I used those gigantic chilies because they're not as spicy as its deadly mini counterparts, especially this recipe already calls for 1/2 cup of dried chilies. The kind of small red chilies in Taiwan are like 5 times spicier than the ones found in California's grocery stores. 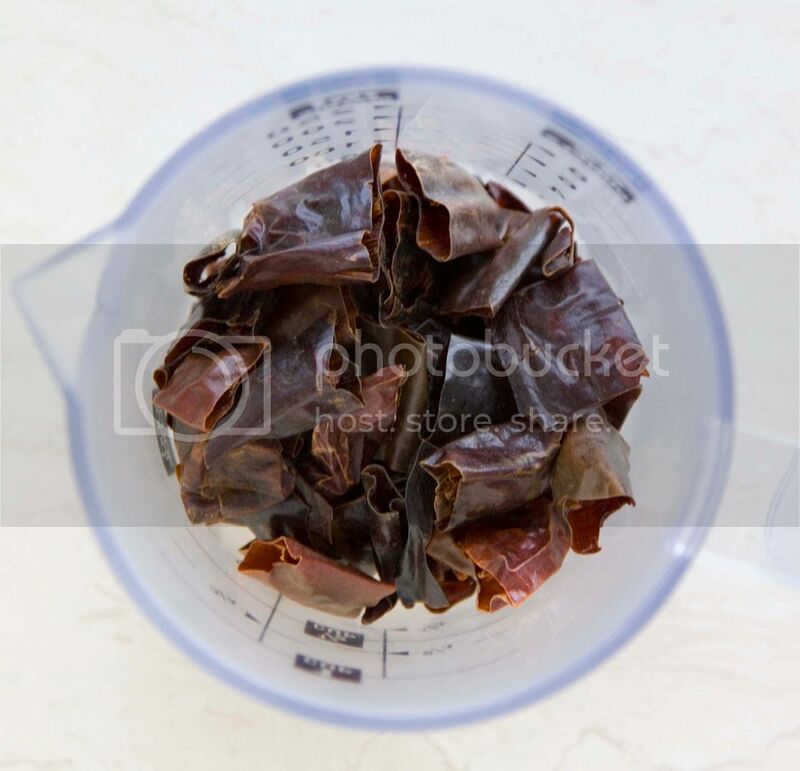 You might want to take that into consideration when deciding on how many chilies to use for Chinese recipes. Drizzle some olive oil to the pan and turn to medium high heat. Add in peeled garlic cloves and let it sear till slightly browned. Add in dried chilies and scallion. Give it a quick stir. 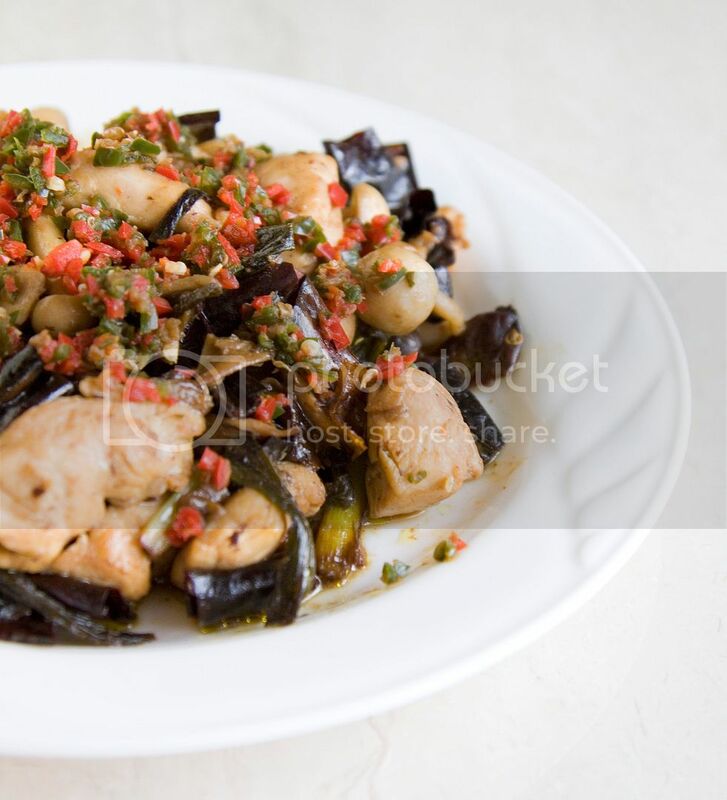 Wait till the scallion starts to appear slightly dried, add in the beach mushroom along with one teaspoon of brown sugar, cook for about one minute. In the meantime, pour some corn starch onto a plate. Transfer the chicken onto the corn starch but make sure to leave the residual marinade behind. "Massage" the chicken with the corn starch. The more you massage the meat, the more tender it'll get even when accidentally cooking the meat for too long. Check on the stove and see if the mushroom is about cooked through then add in the chicken. 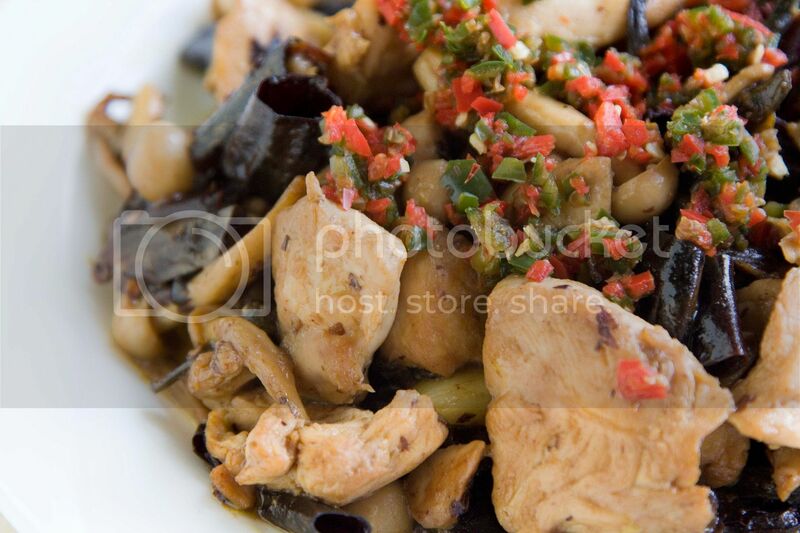 Make sure to stir the mixture constantly so the chicken won't get overcooked on one side. Add in the salted black beans soon after. Cook till all the remaining liquid has been reduced. Taste and see if the leftover marinade needs to be added to the pan to increase saltiness. Lastly, garnish with some finely chopped fresh chilies. Make sure to mix the fresh chilies with other ingredients before digging in. I miss those gigantic chilies over here in CA! 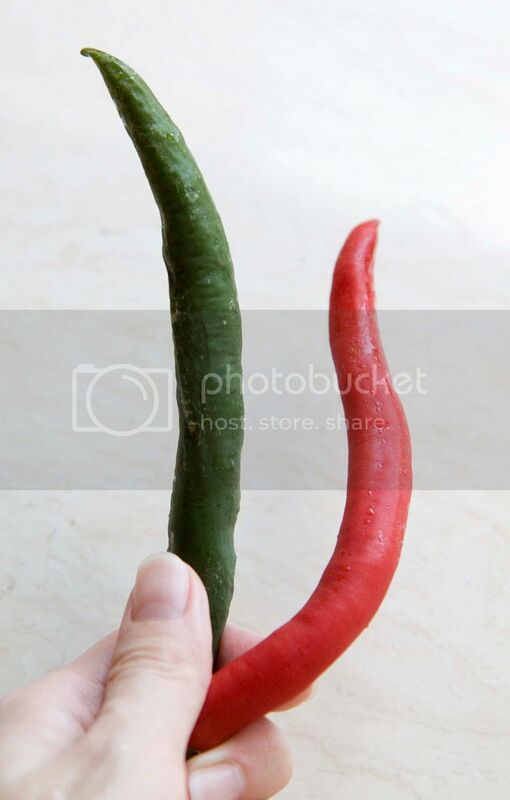 I don't know but jalapeno or serrano is definitely not a substitute of those gigantic chillies of Asia. I feel you, but I miss the small yet deadly little red chilies back in Taiwan! Can't find anything as hot here in CA!